We’ve all heard training in a martial art compared to the metaphor of climbing a mountain. The metaphor provides an inspiring and instructive image, but Saotome Sensei has some cautionary words about dangerous potential mental pitfalls it poses for teachers. 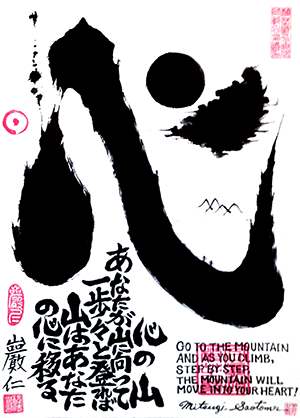 The metaphor of “climbing a mountain” is one used in many martial arts. It nicely captures the amount of determination and effort required to make forward progress, while also leaving room to respect other schools of martial study – “there is only one human species, and all paths lead to the top of the same mountain.” It also encompasses the role and relationship between teacher and student; the teacher’s job is to forge the path ahead of the students while pointing out the dangers and potential missteps, and where to place the hands and feet and eyes to climb further, faster. It even captures the idea that there are many climbers, and no matter how skilled the teacher there are always others higher on the mountain. The mountain top can never truly be reached. Unfortunately, the mountain metaphor comes with a mental trap – it lures us to thinking that after we have climbed a while, we can rest and enjoy the view, and appreciate our accomplishment. Climbing is tiring, and since the top of the mountain never really gets closer, it gets tempting to say “the view from here is good enough”, and “I accomplished this, this is enough!” Unfortunately, when the person in front stops moving, it makes it very difficult for the climbers behind them to keep climbing themselves. The following discussion is drawn from two conversations I had with Saotome Sensei that touched on this theme. Sensei emphasized “If the teacher doesn’t grow, the students cannot grow.” Of course, if a teacher doesn’t grow beyond nidan level technique (for example), it’s hard for his or her students to grow up to or beyond nidan level technique. More than conveying that students cannot grow beyond a certain level, however, the Dojo can either be a “learning” and “innovating” Dojo, or it can cultivate the culture of mimicry and repetition. Sensei emphasized that when the Sensei “stops climbing,” the students at all levels have the danger of never becoming climbers. Students follow the example of the teacher, and more than striving to learn what the Sensei teaches, they consciously and unconsciously reflect the attitudes and outlook of the Sensei too; and if the Sensei is not actively challenging themselves, then the students see that trait in their teacher and either leave or become comfortable in their training too. I challenged him one step further. “I ask then, what do you do differently now, than you did last year? How have you grown? 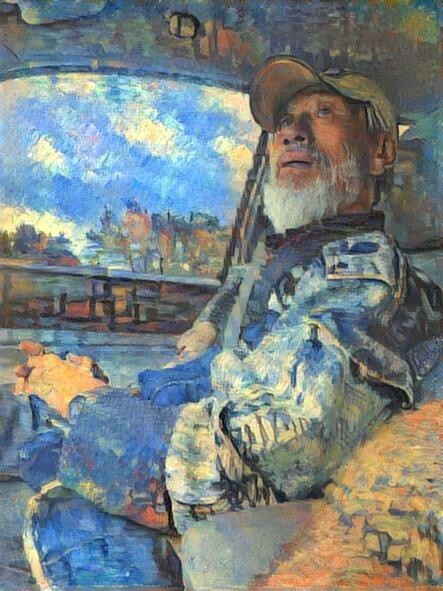 How do you meet Uke differently?” To respond, he drew a picture of man standing on the face of the Earth, with a vertical line connecting Earth to Heaven meeting at the man’s hara (center). He then drew a triangle around the man, indicating that it represented the man’s aura. “Every day, I strive to see more of Uke’s intent and desires. I see more and more of their aura and spirit. My eyes see less of their physical threat, and instead I see their relation to me, to nature, to Heaven and Earth, where they have harmony and strength and where they break their harmony to approach me. “Far too often, teachers hold on to past training, and this creates styles and encourages learning to stop. However, there are no styles in this, in Nature. What style do you use to digest your food, to breathe your air? I meditate on this, and how I respond to Uke manifests as an expression of harmony, of Nature. Budo is not the study of what we did when we were young; Budo – Michi – is ‘whole life.’ My study never stops, because I am surrounded by Nature and people and their position in Nature at all times. I study perceiving each moment as new, each Uke as if I have never seen them before.” Sensei does not do traditional seated meditation as one would imagine from Yoga, zazen, or other meditative arts; for him, meditation is the practice of perceiving, interacting, and balancing with his surroundings mindfully and with total investment of his attention. Each attacker is different. You try cannot use yesterday’s technique, yesterday’s solution on today’s attacker. Each attack is different. Similarly, each student is different, and what each student needs is different each day. You cannot give yesterday’s lesson, they must be given what they need to climb further today. Finally, you as a person, as a Nage, need to give yourself room to be a different person, a different Nage today. The underlying principle of the universe is entropy – the relentless and omnipresent erosion of all matter and energy. Unfortunately, this principle applies to our efforts to study and progress as students of the martial arts. As we discussed the mountain metaphor for training, Sensei and I observed that training, and life, is actually much more like trying to climb a sand dune. When you are climbing a mountain, you actually can stop to rest, camp, or enjoy the view; the mountain does not move beneath you and is indifferent to your efforts. But life is generally not like that – when you stop climbing, you start sliding. We are in a race against time and age, and the longer we train the more our body fails us, and the more inflexible our minds are tempted to become. Thus, it’s more like trying to climb a sand dune, where with every step or handhold, we sink in and find little purchase. Every movement dislodges avalanches of sand that pull us downward, and when we stop moving we inevitably slide and start losing the progress we worked so hard for. The only way up the sand dune is to never stop struggling ahead faster than the sand tries to pull you backward. Sensei liked this metaphor, because if one thinks of training that way, there is no resting on rank or titles or past accomplishments; today’s Shihan may be passed in skill and insight by somebody of far lower rank but greater determination. I liked this metaphor because it gives a different meaning to grit! A neurologist researcher friend once told me that the brain works like this too. He said that while recent research showed that exercising the brain can ward off dementia and effects of some degenerative brain diseases. However, he indicated that contrary to common belief, “exercising the brain” means much more than reading books and doing crossword puzzles; the real neurological benefits are observed when the brain is challenged by new, difficult learning like learning new languages, mastering different kinds of puzzles, learning memory retention techniques, etc. Research even shows that it’s possible for new connections to be made in the brain one’s entire life. It isn’t doing what you know and are good at that keeps the brain young and growing, it is doing what is difficult, new, and qualitatively different that makes the difference. As Sensei and I continued to talk, I observed that probably no teacher thinks of themselves as holding their students back, or admits when they have stopped learning. How, I wondered, can one tell if one (as a teacher or individual student) has “stopped climbing”, or whether one is still successfully inspiring students to climb higher themselves? Sensei laughed and said “it’s easy to tell, because going down the mountain is easy!” If your study is honestly challenging for you, if you pursue the things that challenge you, if you are risking failure, then you are probably climbing. However, Sensei said “there is no such thing as failure in Aikido; only opportunity, reaction, adaptation, evolution.” You must be studying what is difficult for you, not what is easy. This does not mean difficult struggling with Uke, it means struggling with your own temptation to “do what you know.” You must be making mistakes, even in front of your students; how you respond to your mistakes is a very important element of leadership. You must practice shugyo, and discover your weaknesses. You must identify and study the things that you cannot do, but that others can. No matter how old you are, you can continue to accomplish things you could not do the day before. You must find new insights, seek new changes inside yourself. You must be willing to challenge your beliefs, the things that you believe are facts, the foundations of your skill and knowledge. Just as you must not treat today’s attacker like yesterday’s attacker, you should seek that what you know to be true of Aikido today can be different than what you knew to be true yesterday. Aikido has no form or style, and teachers should study this. Because the teacher and student are linked, you can also tell by looking at your students. Your students should be allowed to not look like you. Laughing, Saotome Sensei said “None of my students resemble me, they are all different! Guy, can you imagine what you would look like if you did Mitsugi Aikido?” While saying this, he hunches down and makes himself awkwardly small; I am much bigger than Sensei! Your students should be challenging your ability, they should be learning and doing things that force you to change your teaching. They should be allowed to succeed in ways that do not reflect upon your own teachings or style. This article was drawn upon conversations with Saotome Sensei during December 26, 2015, and also December 11, 2016 (sand dunes). Image taken as a photo on 12/11/2016, painterly effects by Dreamscope. That is a fantastic analogy and an excellent mental model…not only for the “struggle” and “falling backwards”, but for the sensitivity required to move with the shifting of the sands in order to continue upward.